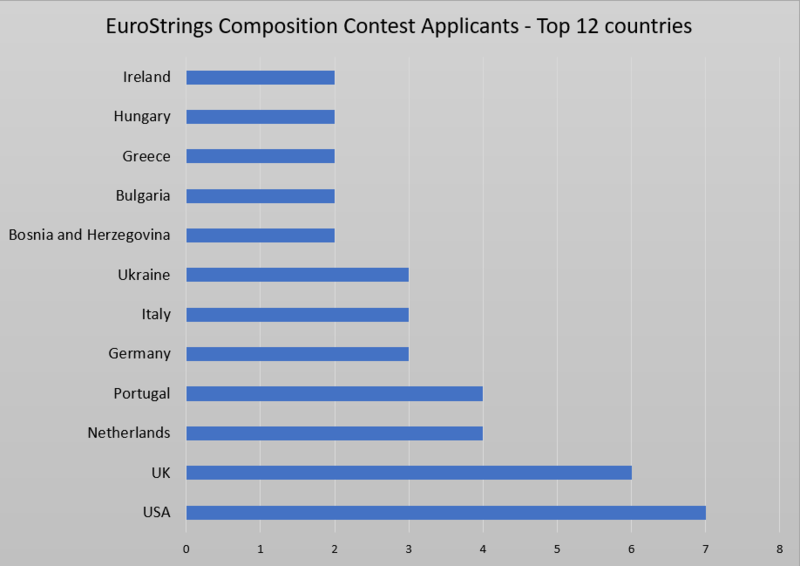 1st EuroStrings Composition Contest for Classical Guitar closed its applications on Tuesday, January 15. The aim of the competition was to promote emerging composers from Europe. During the two months, we received 57 applications from 22 countries. Composition Contest Jury Members are Nina Šenk, Sergio Assad, Stephen Goss, Brian Head and David Pavlovits. The winner and the finalists will be announced on EuroStrings website and social media pages on February 28. The winner will receive a cash prize of 1500€, and the winning composition will be a compulsory piece to be performed at the final of the 2nd EuroStrings Competition that will be held in London 2019. The EuroStrings competition winner will be obligated to perform the winning composition at the winner’s tour in the US and Asia as well as at European tours at which he/she will perform as a EuroStrings Winner. The winning composition will be performed by EuroStrings Artist at the minimum of 6 EuroStrings festivals in the following year, including performances at the Viennese Musikverein. The winning composition will also be recorded on HD video and published on the EuroStrings channel by EuroStrings Editions.